MCH prides itself on having wonderful outdoor environments available for our students to explore and interact with. Our campus is nestled onto 5 acres of natural woodlands, wetlands, and forested hillsides. As part of our life sciences curricula, MCH has an active garden program based on the Montessori model of a child-directed, developmentally appropriate, individualized approach. Each MCH program (Infant/Toddler, Early Childhood, Elementary) provides children with direct access to gardening with the support and guidance of our Gardening Specialist. 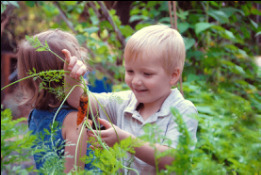 Several direct goals of gardening with children include nurturing independence, inspiring awe and wonder in the natural environment, and meeting several cognitive objectives such as an enriched vocabulary and taxonomy lending to a sense of where plants fit into the greater world. MCH also maintains a small selection of livestock, including goats and egg-laying chickens and rabbits. The livestock pens are incorporated into our grounds with ample opportunities for the children to interact with the animals. Feeding for our animals is supplemented with food waste scraps from our classrooms and kitchen. The Nature Trail is a community-created place of stewardship, discovery and connection to the natural world and an evolving space in which children experience a sense of belonging to our world and our community. 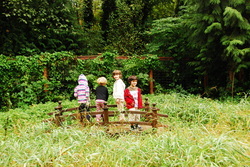 Our Nature Trail is certified as a Natural Wildlife Habitat by the National Wildlife Foundation and as a Backyard Wildlife Habitat by the Washington Department of Fish and Wildlife. Thanks to the support of the MCH Parent Association, the 680 ft, fully-enclosed Nature Trail is a valuable part of our community. Learn more about our cherished Nature Trail here. In 2009, Nicole Champoux, our Elementary Program Director, received an ING Unsung Heroes Scholarship award. The award money was used to develop natural resource management curricula, looking at water and power usage on campus. The school purchased wetland and soil testing kits, solar education kits including solar ovens, and a power house kit, which students use on the protected wetlands on our campus. Funds that help "grow" our garden are provided by the MCH Parent Association and the school, along with generous seed donations by Peaceful Valley Farm and Garden Supply and Baker Creek Heirloom Seeds. We've also benefited from a grant sponsored by Whole Foods and the Whole Kids Foundation.